I decided to use Claret and Cream as colours, inspired by the Phoenix flag. Instead of using their current "Arizona" script, I designed a "PHX" one, using their font style. 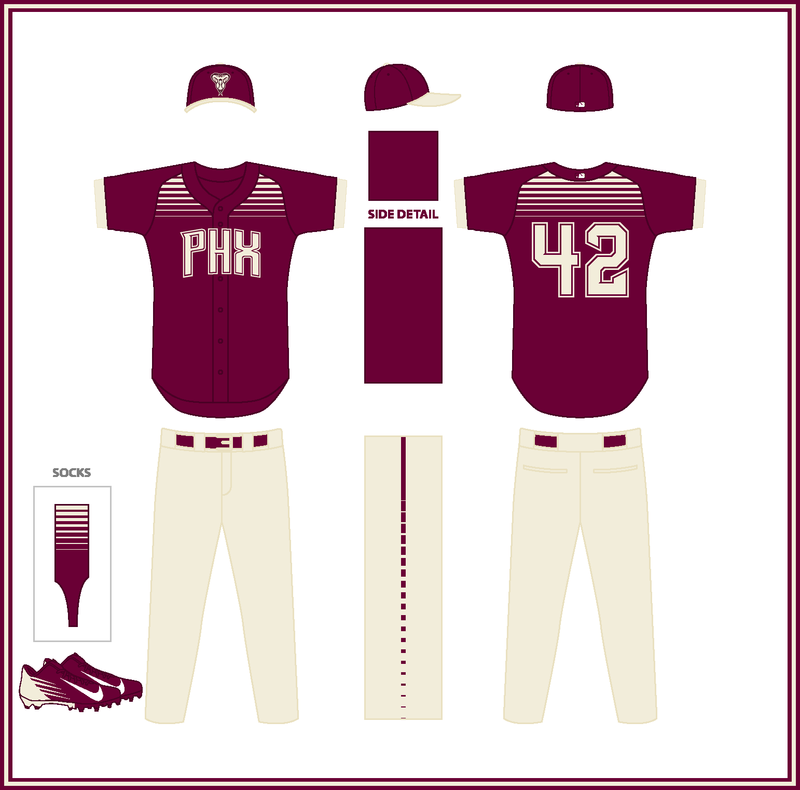 The top front of the jersey, as well as the pants and socks feature a striped gradient, inspired by the Sunrise from the Arizona State flag. Let's continue with the Cardinals! 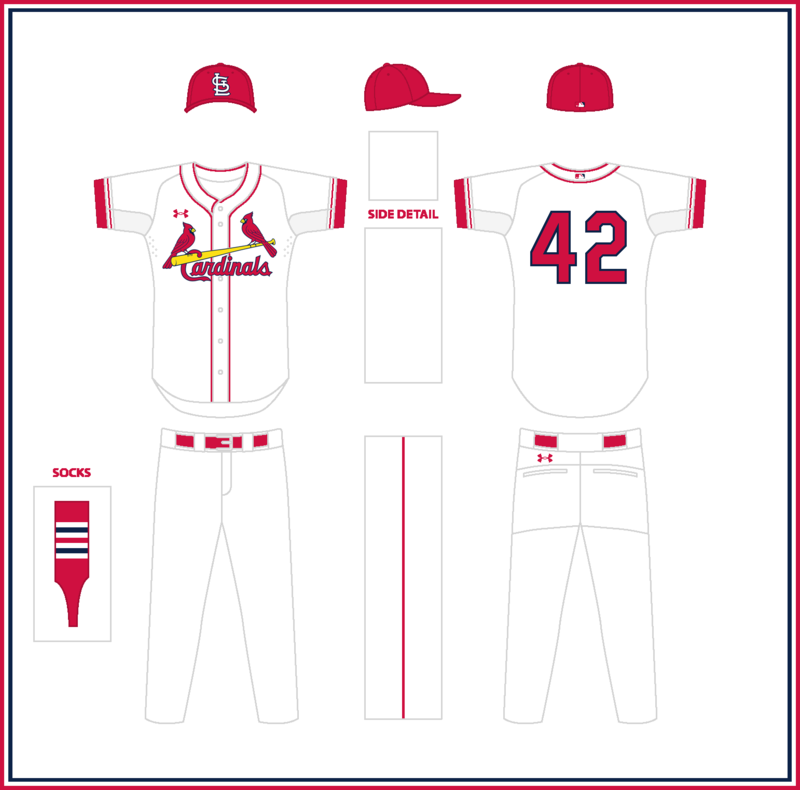 The Redbirds have one of those few timeless looks in the Majors, but I find their current uniforms a bit bland, specially after having interesting designs throughout the years. That's why I decided to bring back the style they used from 1922 to 1938. 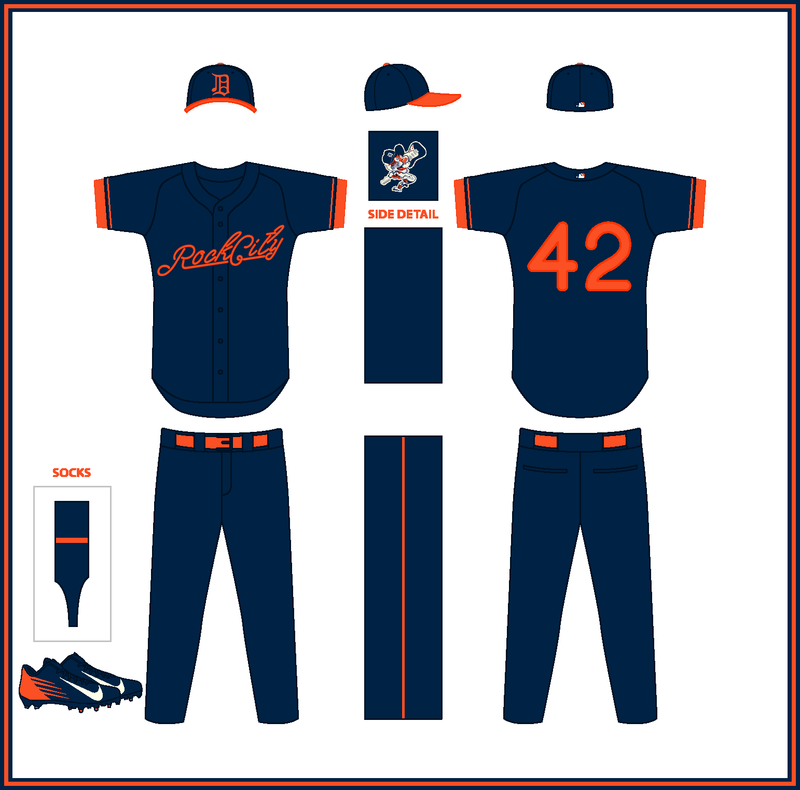 Apart from that, I also returned to the Navy Blue caps for the roads, and changed the Sunday alt uniform, designing a new one which features the logo and script from the 20's. Cool ideas for the Rays. 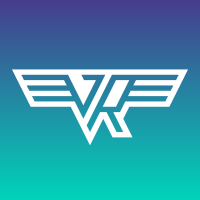 Sadly, I think the dark green doesn't contrast enough, how about making it in light blue? Since my beloved Mariners announced Ichiro is returning, I'm posting Seattle today. I decided to use "Emerald City", which is the city's main nickname. Using this as a main colour, I added brown, inspired by the famous coffee industry of coffee shops of the city, and off-white, to create a more balanced look. Also, I added the base of the Space Needle on the sleeves, using its top as cap crown. Another solid concept! As a fan of the Yellow/Brown combination, I go for the last option! 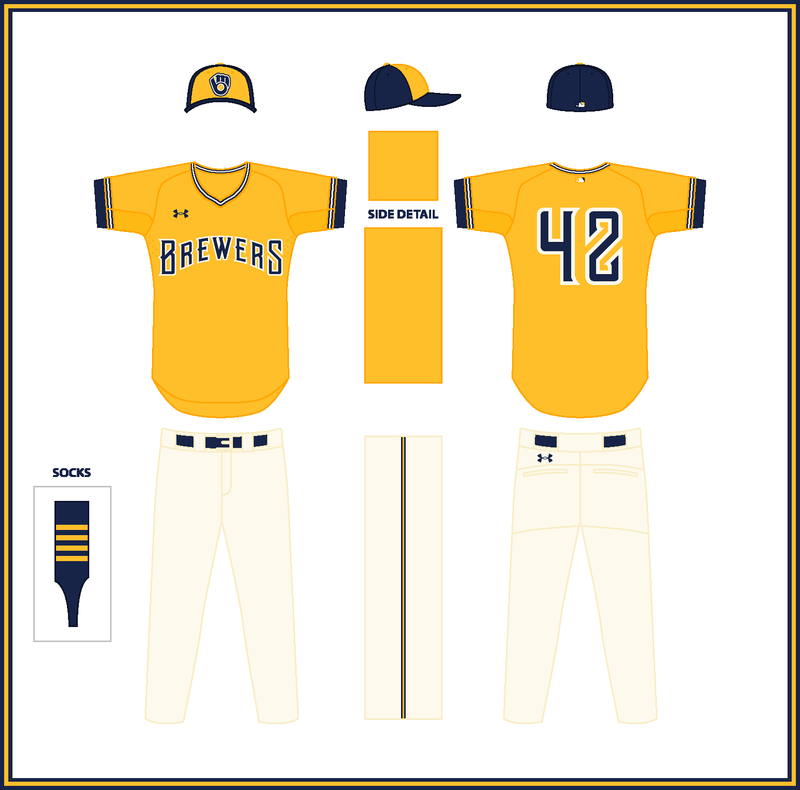 One of the best Brew Crew concepts I've seen on this forum! This is pretty much exactly what I want them to do when they hopefully redesign in the near future. I always felt those '90s Germanic wordmarks and numbers were extremely underrated, and they look great in navy and gold and with simplified outlines. That home set is absolutely stunning. And great job @Carolingian Steamroller with the updated BiG logo. Cheers! Looks great! It's amazing how much switching to a single, thick outline clears up the mid-90's brewers script. Combined with the Pilots sleeves it really works. Double bonus for the shade of powder blue on the road! The numbers look great too. Minor nitpick. Switch the stirrups from four gold stripes to three to match the three gold stripes on each sleeve. The neon sign idea is "representative" and fits the city, but also the execution is great. 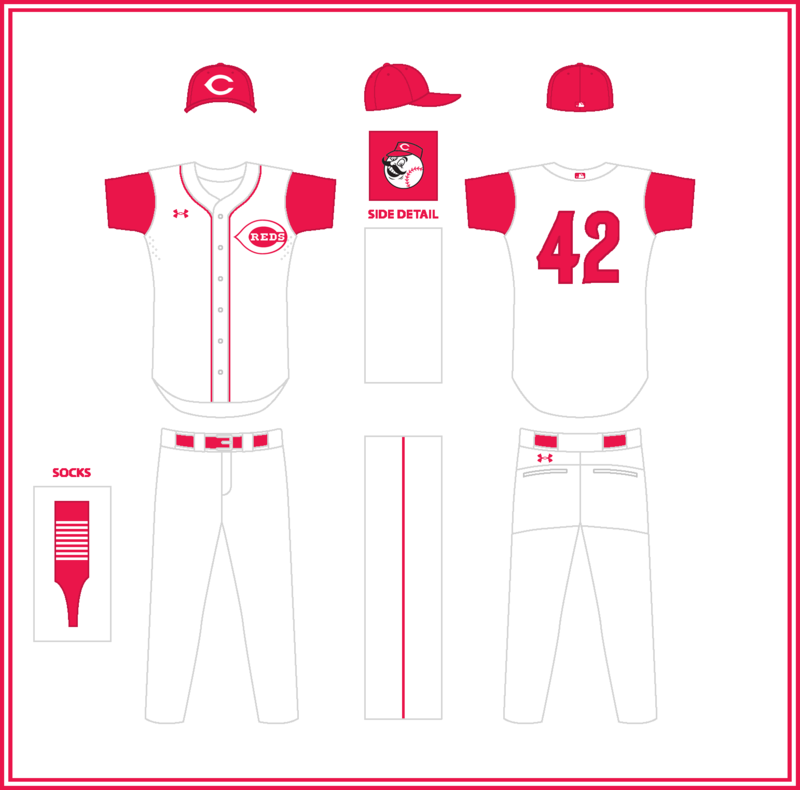 After such a great turnaround for the Phillies, it's time for Cincinnati, another design inspired by the city flag. This time, I wanted to combine the flag's classy "C" with one of the club's older uniforms, so I decided to use the famous sleeveless jersey. 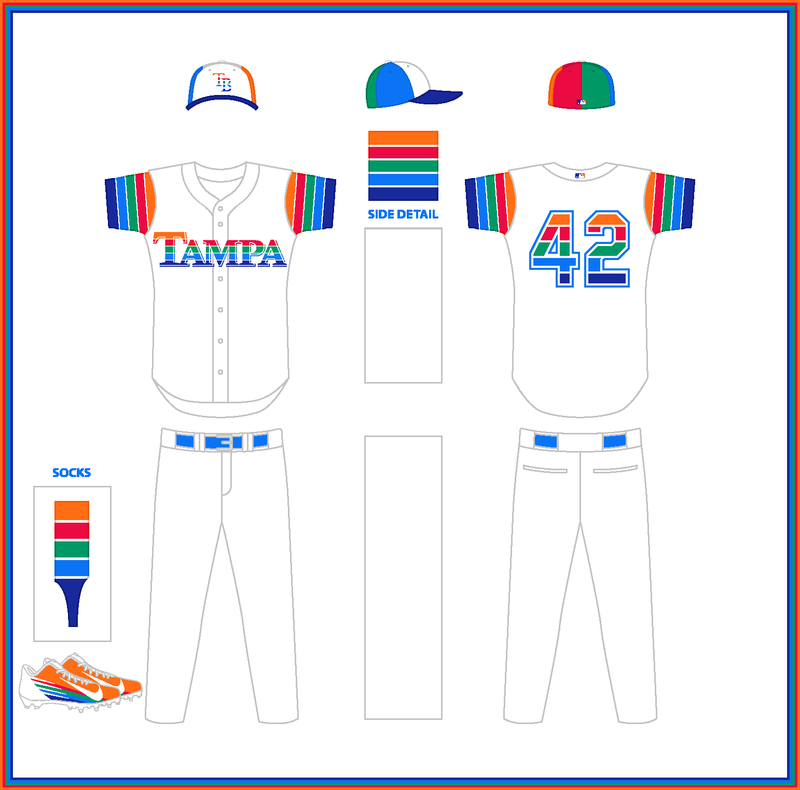 Also, to top off the design, I decided to add the three waves from the flag on the socks. Let's continue the series with Cleveland. This design is the result of the collaboration of the whole group. We wanted to combine the classy look of the Hope Memorial Bridge and its Guardians of Transportations with a colourful scheme, inspired by the Cuyahoga River and its tendency to catch fire. Special thanks to @SFGiants58 for letting us use his amazing Guardian logo for the cap! Today we won't be able to post any designs. 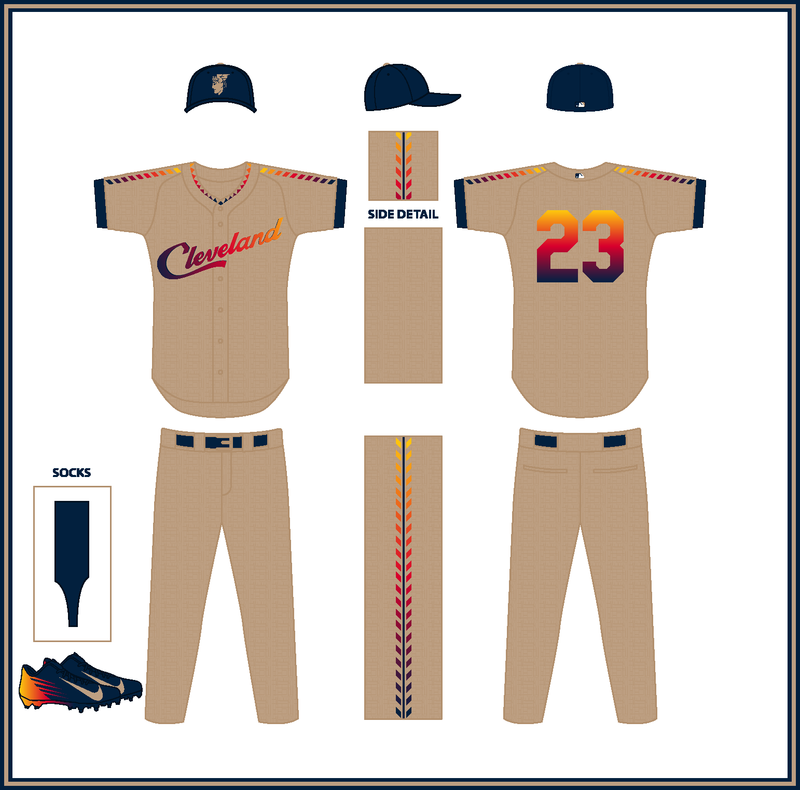 We're ending Cleveland, whose design will feature an interesting mix of styles. We hope to have it done by tomorrow. Another week, another team! 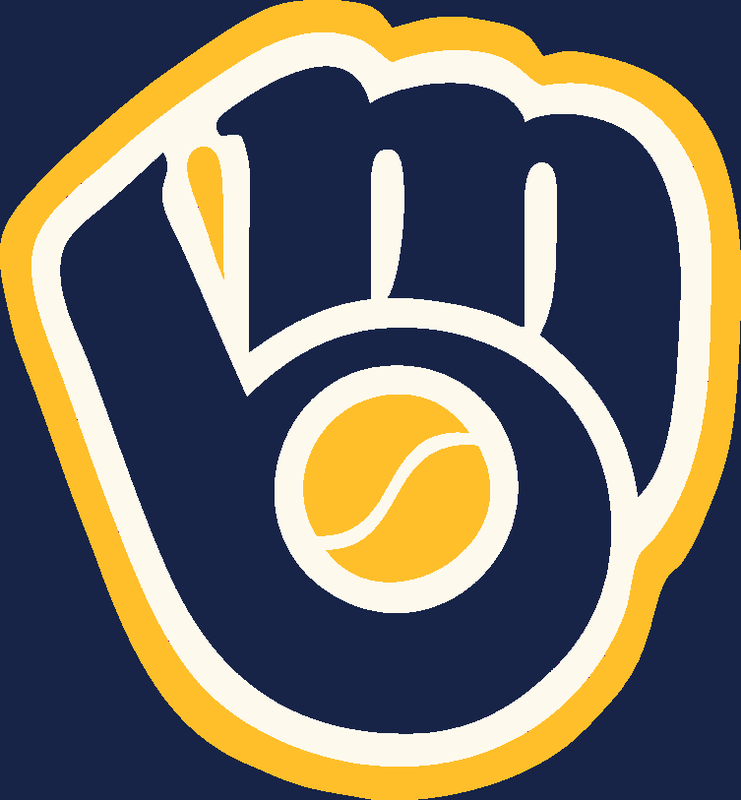 Let's continue with the Brewers. Credits to @Carolingian Steamroller for letting my use his amazing glove logo and special thanks to @coco1997 for giving me the idea of using the 90's scripts! Well done on all of these uniforms! 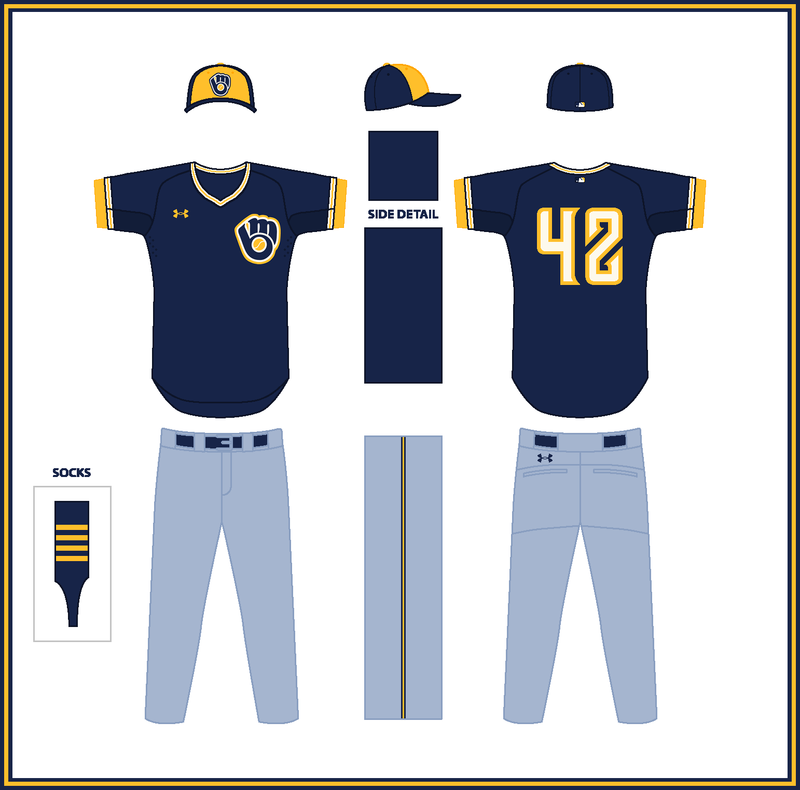 I am a big baseball fan, and I would like for every team to use your designs in real life! For Cincinnati, I would like to see the wordmark that you used on the alt uniforms on the road uniform. Otherwise, it looks great! 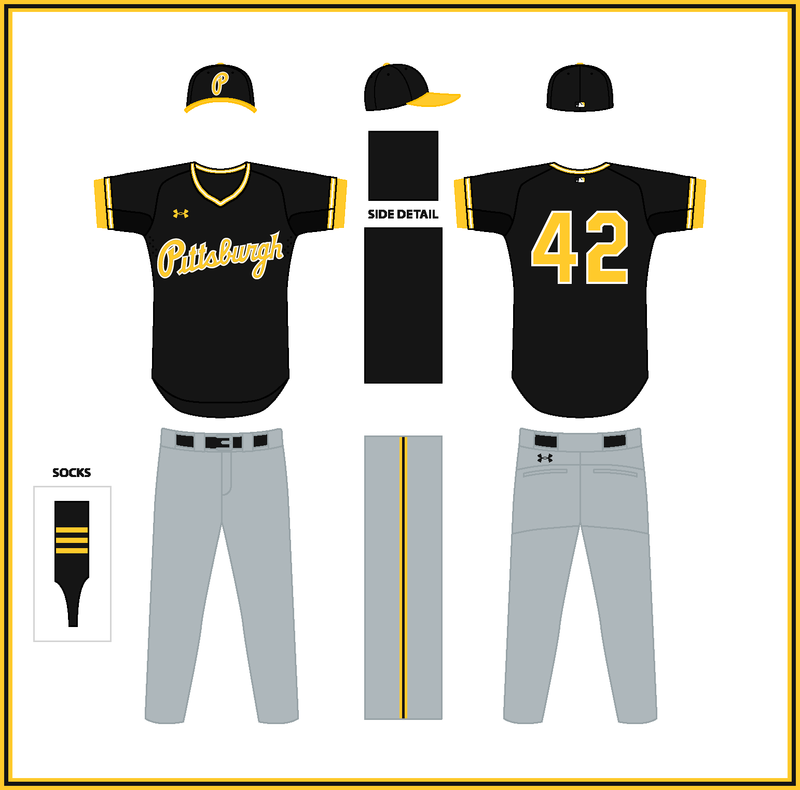 Also, I would like to see a black alt for the Marlins. I like the black uniform that they have now, and with more teal could be very nice. Let's see how it looks on the uniform! So you go with the Flag of St Pete for inspiration but, specify the City of Tampa on the jersey, in which the team doesnt play in Tampa (yet)? Interesting theory, but the execution is good. I think the hat could be a solid color rather than crazy panels. My idea was to use St. Petersburg colours, where Tropicana Field is located, but keeping the team's current name. Continuing the series with Tampa. Another flag-inspired design. This time, the uniform is heavily inspired by the St. Petersburg flag. I decided to go for a sleeveless jersey, trying to reflect the warm weather of Florida. As for the script, I decided to use only "Tampa", since I've never been a fan of the "Tampa Bay" wordmark. Oh, and thanks to @MJD7for helping me out with the cap design! The Reds look spectacular! 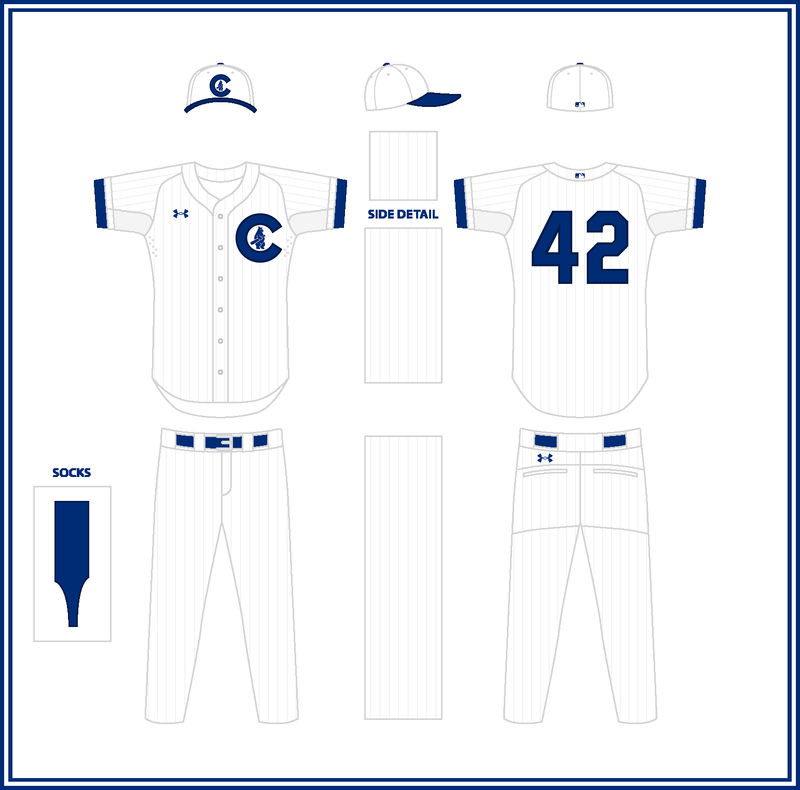 The removal of the black drop shadows, the sleeveless home jersey and the new Old English "C" cap are all great changes and additions. I also really like the new sock stripes; it feels like something Stance would do. 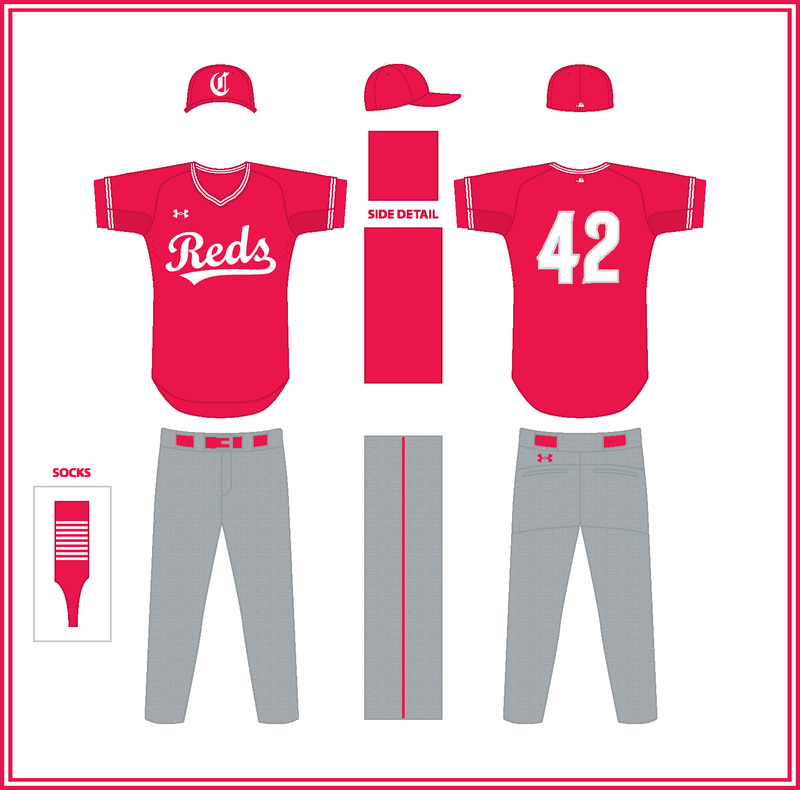 The melange fabric effect on the road uniform works really well here, as the Reds are one of the oldest teams in MLB. Stoked to see the Brewers next! I just noticed that the headspoon piping is missing from the back of the Reds home jersey. Are those red buttons on the alternate jersey? If so, I say that's a great idea! Yes! 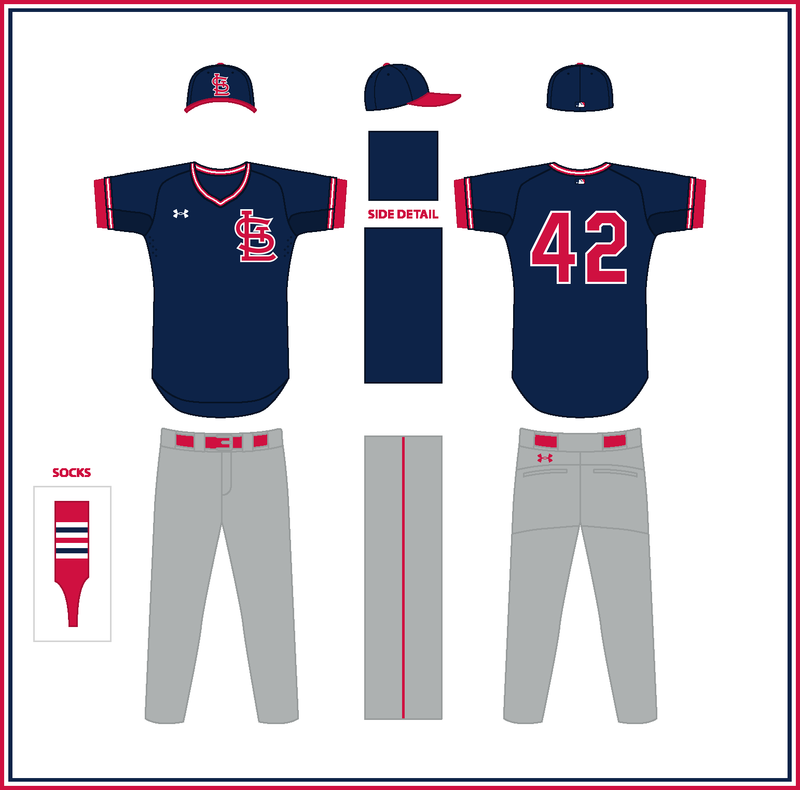 The uniform draft suggests the original design used red buttons, so I decided to keep them. Let’s continue with the second team from the NLC, time for the Big Red Machine. 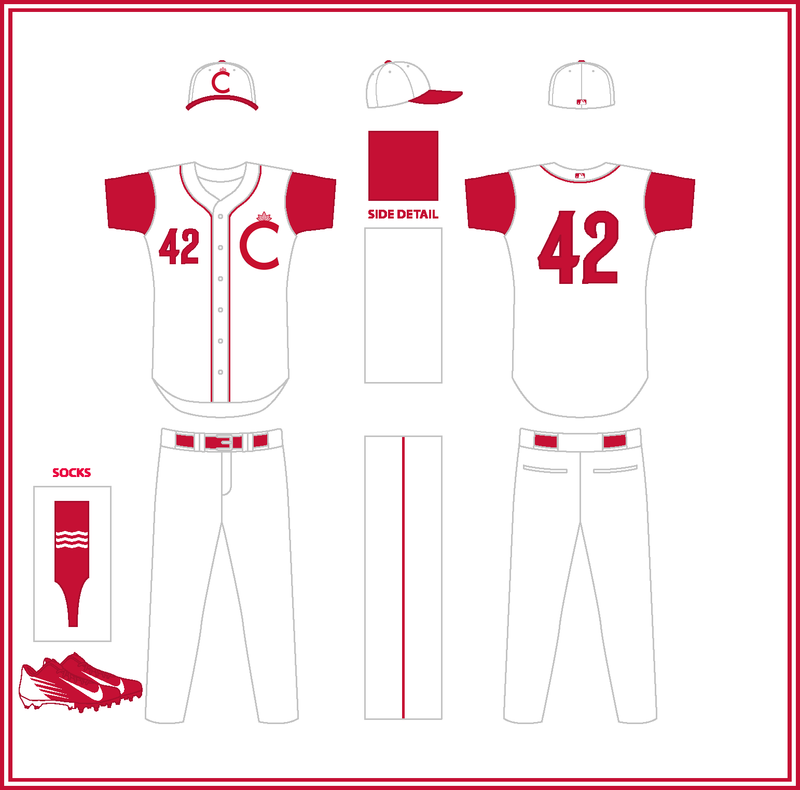 While I kept the current Reds logos, getting rid of the black shadows, the uniforms have changed, making a combination of eras. 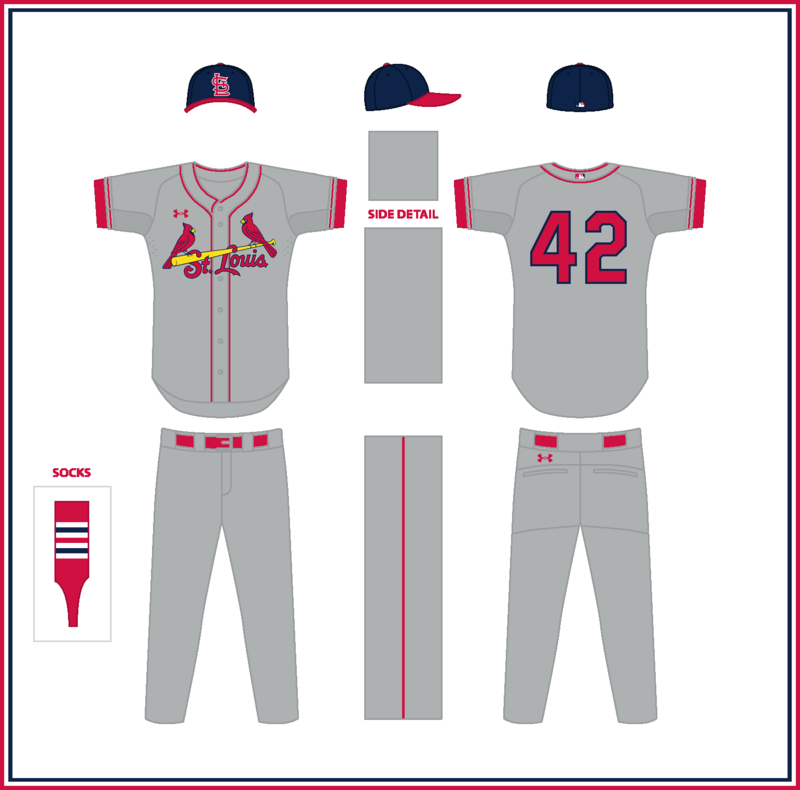 The home uniform blends the current style with the sleeveless era, while the road remains almost the same, only changing the piping. 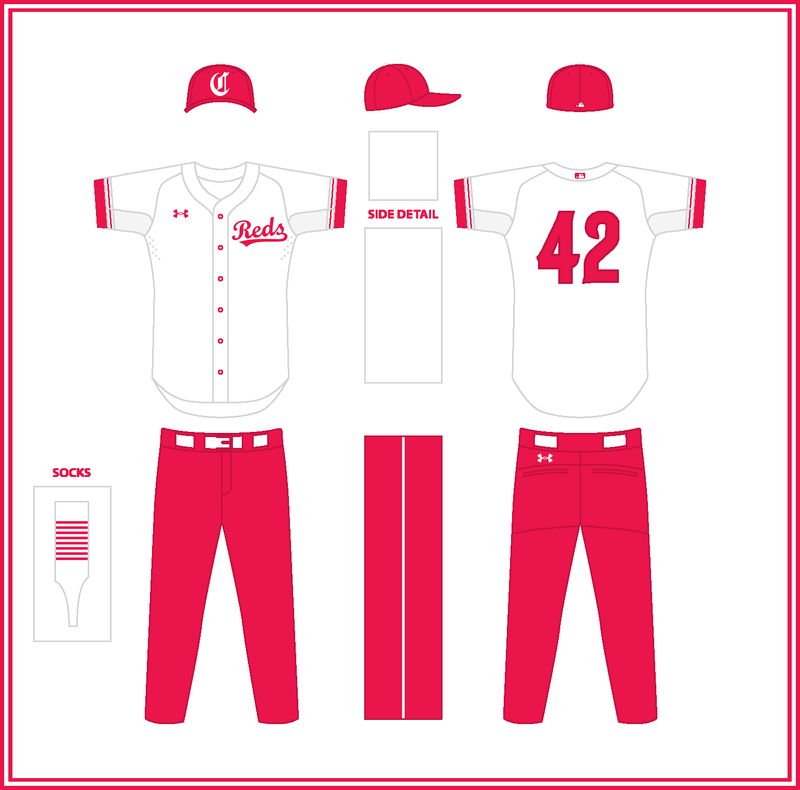 The Sunday alt is inspired by the 1936 home alt design, and the red alt, to be used both as home and road, is inspired by the current batting practice jersey. For these last two I used the XIXth Century “C” as cap logo. 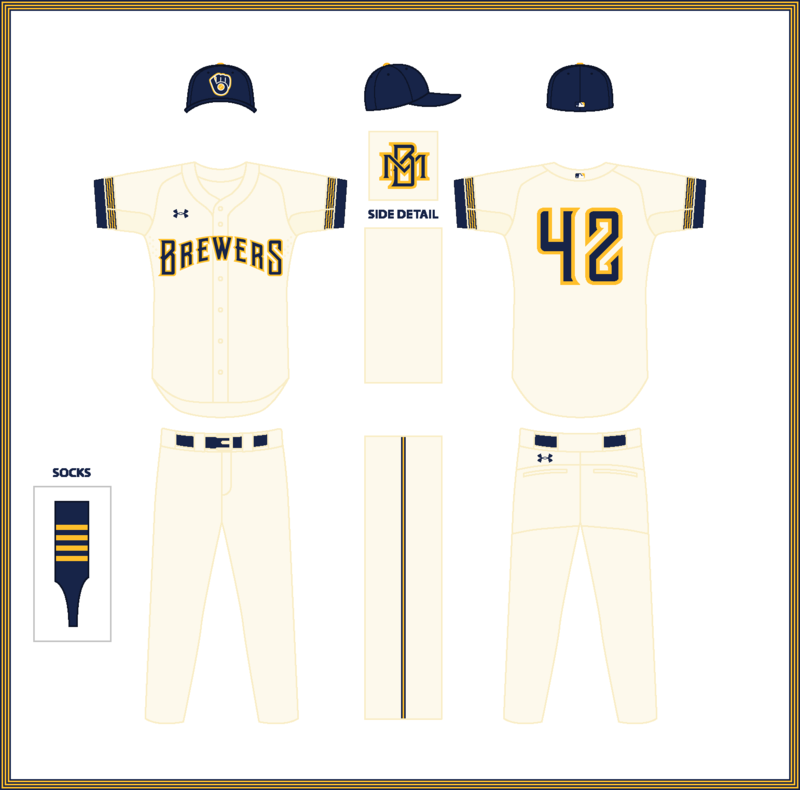 All the designs feature pinstriped socks, inspired by the 1956 uniforms. 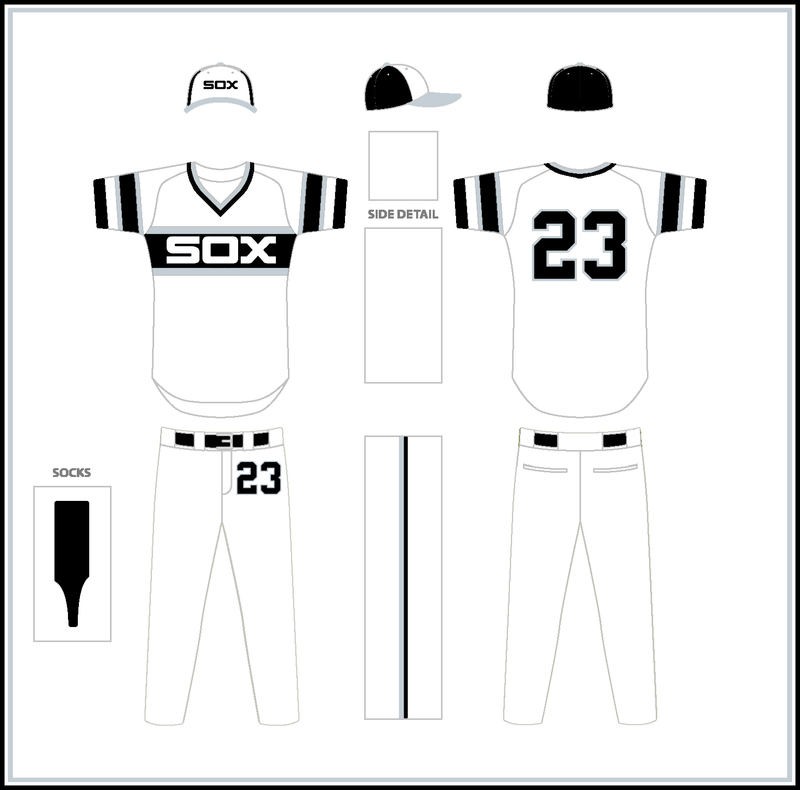 The style used by the White Sox during the 80's is probably my all-time fav, and in B&W it looks even better! 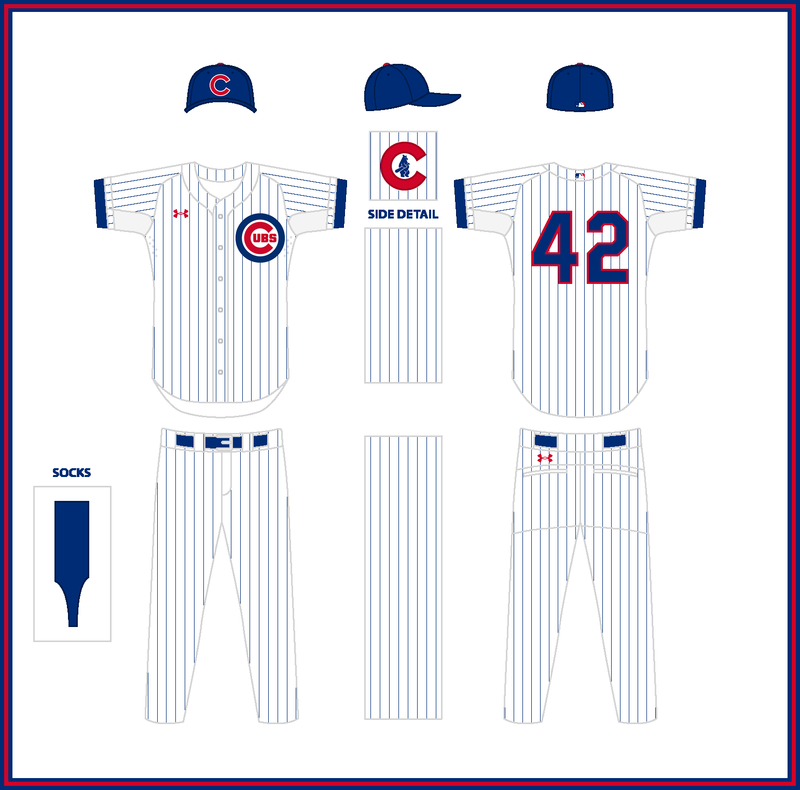 Cubs look great but I find myself wanting a white outline on the "C" with the standing bear. I tried to do it, but didn't managed it I'll work on it, and if a get a good result, will post it! I love the Gateway Arch and the St. Louis flag. I think this design blends those two things perfectly! Time for Detroit. This city is known for two of my favourite hobbies: cars and Rock ‘n’ Roll, so I definitely had to choose it. Given the first theme was used by the Pistons, I decided to go for the second one. I completely changed the font, using a script inspired by neon signs. 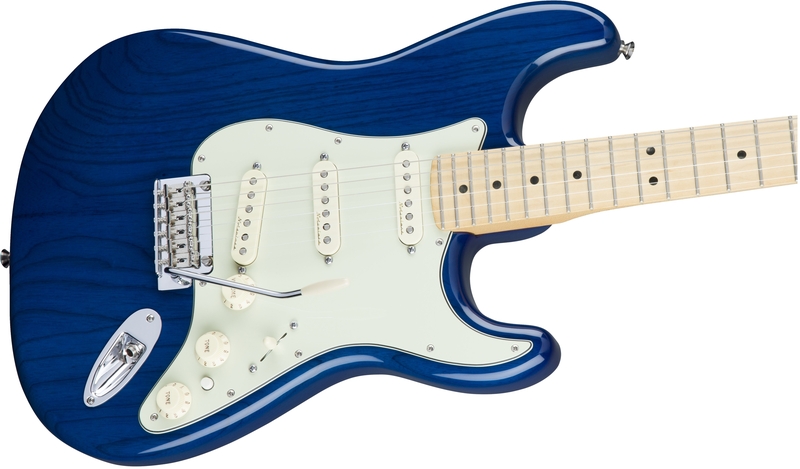 As for the logos, I added a quarter note to the Old English D, and a Strat to the 60's Batting Cat logo. I didn't realize that's what that was. I thought you were basing it on a guayabera. I hadn't thought about that, but the resemblance is more than clear. Also, given the Caribbean communities in Miami, it'd also make sense! 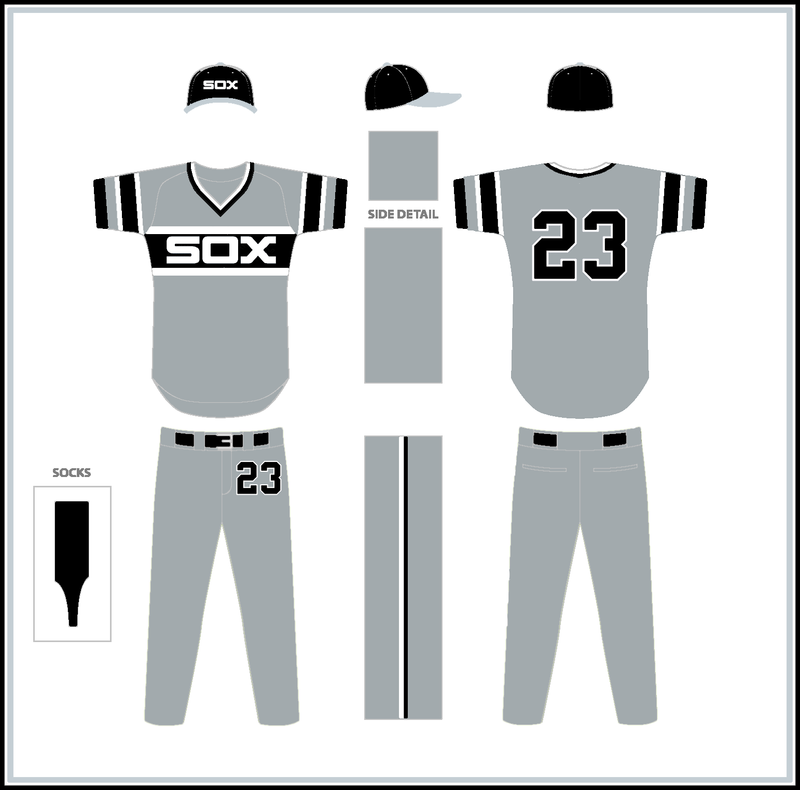 Man, I'm a White Sox fan and I even I would buy that road alt! It's such a fantastic re-purposing of an underrated wordmark from a really interesting period in the Cubs' uniform history. The all-white set is equally superb and would make for a great Sunday home alt. It manages to look vintage and modern at the same time, which is no small feat. 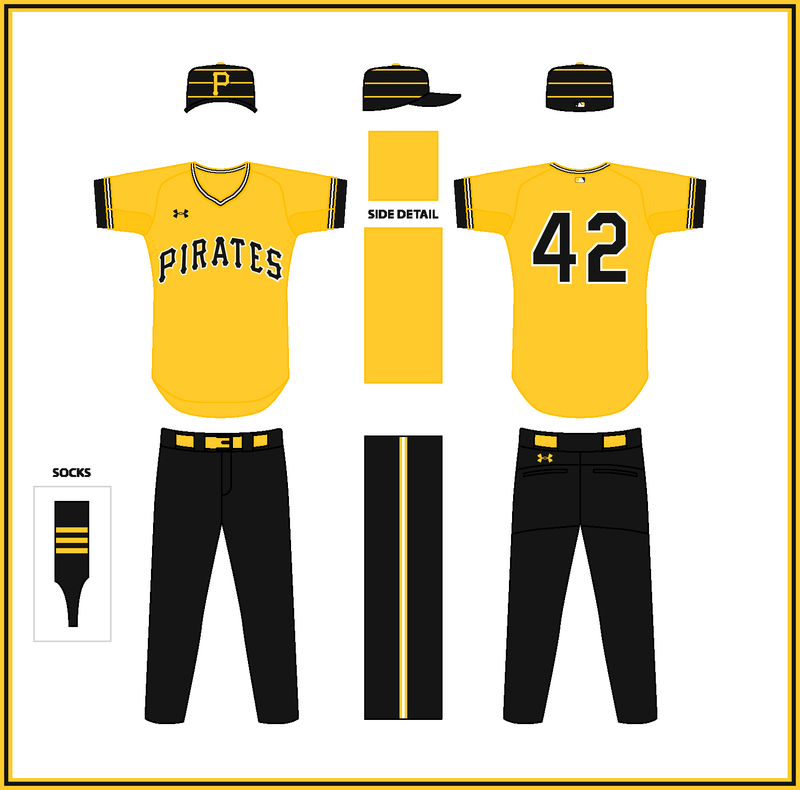 The subtle pinstripes are a great touch. 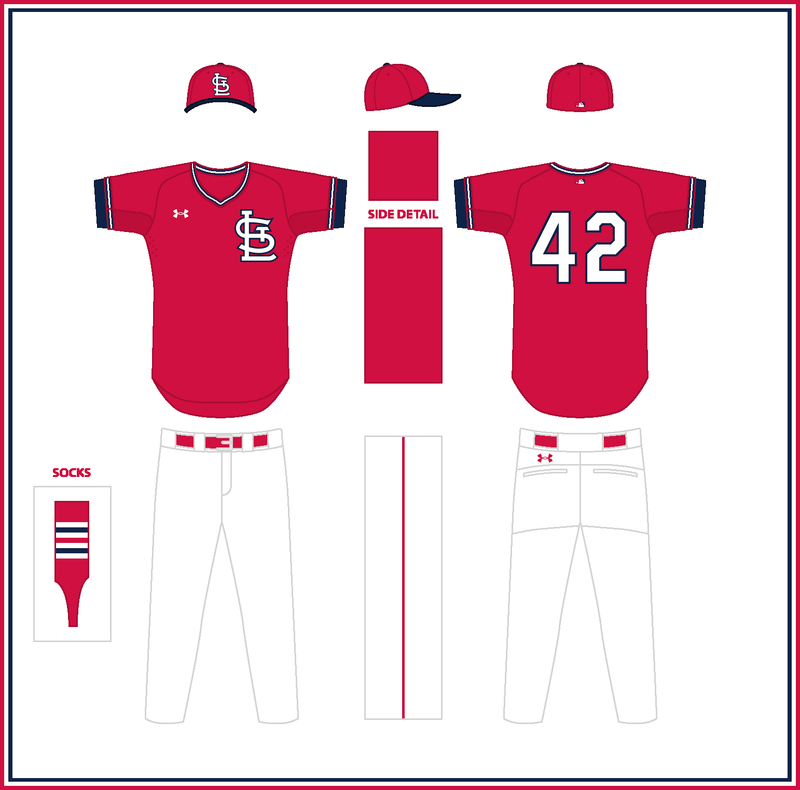 While you said you made no changes to the home uniform, I should point out you did, by going with standard block numbers over the more rounded numbers the team actually uses. I do have one small suggestion: How about replacing the walking bear sleeve logo on the home and road jerseys with the standing bear logo used on the home alt, but making the "C" red? From the Nats to the 2016 champions: the Chicago Cubs. 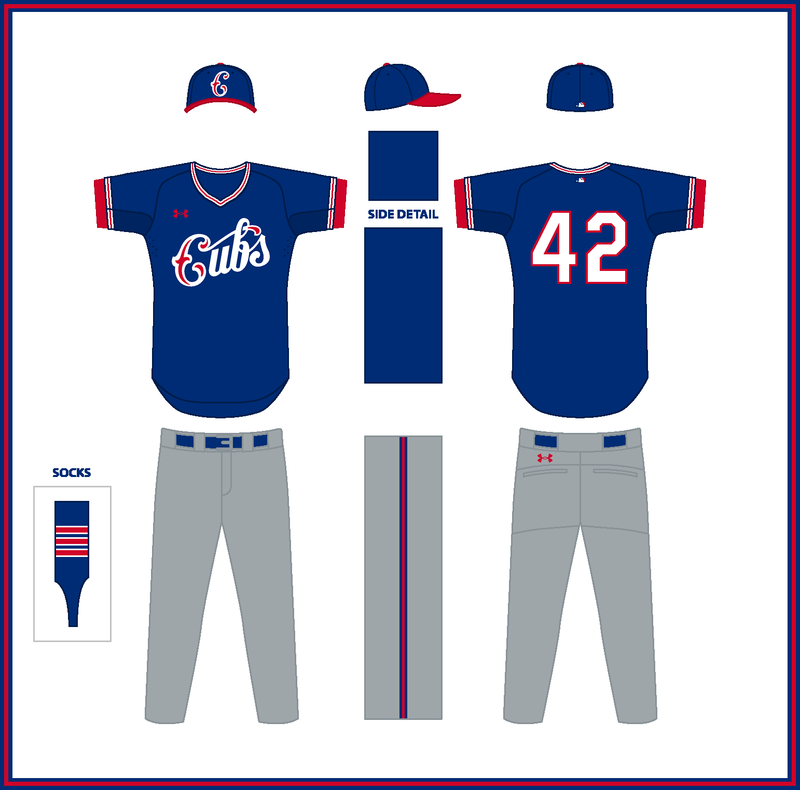 The Cubbies have one of those iconic and probably timeless looks, but I've made a couple of tweaks to every unifor except for the home which remains the same. For the road I brought back the style and wordmark used during late 50's to mid 60's. 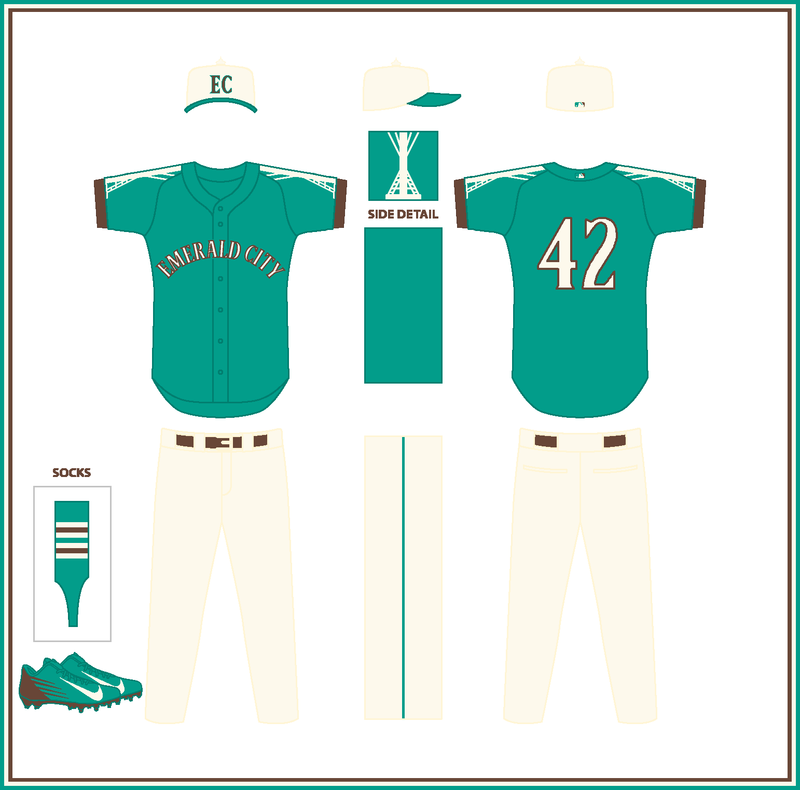 I made the biggest changes for the alts: the home is inspired by the early club uniforms, featuring embossed subtle pinstripes and the C with the standing bear props to @coco1997 for suggesting the idea), while the other alt, which could be both home and away, uses the 1931/33 wordmark.